"Faith in Color: A Photographic Exploration of Race, Religion, and America in Tribute to C. Eric Lincoln," explores the deep roots of religious influence in black communities. The exhibition showcases the work of Evan Nicole Bell, a Duke senior pursuing a self-designed Program II major "Documenting Justice: The Role of Photographic Narratives in Activism." See her portfolio: http://www.evannicolebell.com/. 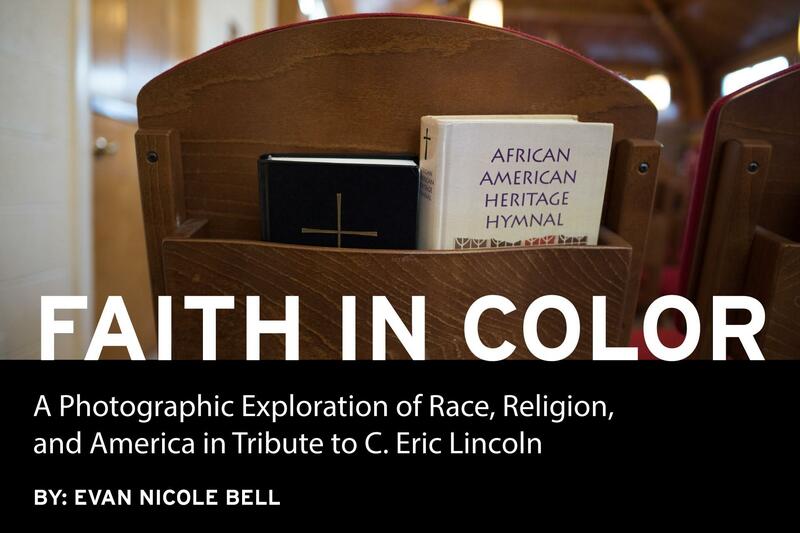 Evan created "Faith in Color" as the Duke Chapel C. Eric Lincoln Theology and Arts Fellow. The exhibition pairs photographs with quotes from C. Eric Lincoln, a professor of religion and culture at Duke from 1976 to 1993. Lincoln was a scholar of black church and religious studies, as well as a Methodist minister who also wrote novels and poems. At 7:00 p.m. on Thursday, April 12 all are welcome to Duke Chapel to view the exhibition, hear Evan speak about her work, and enjoy a light reception. The exhibition will be on display in Duke Chapel April 4 through May 1.